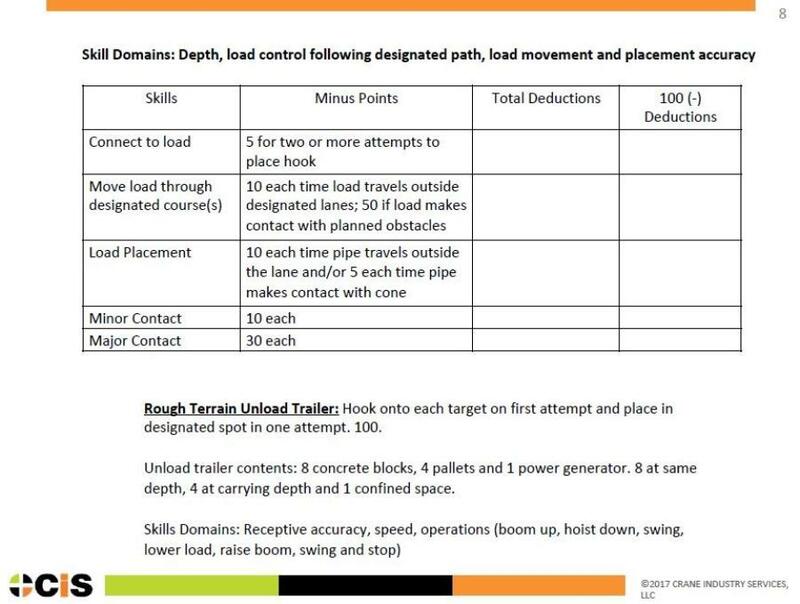 Sample results tracking an individual’s record from novice to qualified crane operator. CIS has developed more than 200 exercises, many of which can be performed on a simulator, for demonstrating skills related to crane and lifting equipment operation. To assist employers in evaluating and documenting crane operator competency, Crane Industry Services, LLC has introduced a new and efficient process called Qualified Crane Operator Evaluations (QCOE). The process gives employers valuable insights not available in certification testing by identifying specific operator strengths and skills that need to be improved. Competency is defined as one who is capable of identifying existing and predictable hazards in the surroundings or working conditions, and who has authorization to take prompt corrective measures to eliminate them. When it comes to crane operation that may entail familiarity with the type and configuration of the crane, hand signals, rigging and ground conditions, among other factors. The QCOE process graphs areas where knowledge and skill are strongest and where the operator and supervisors would benefit from more training or experience that the employer can provide or can be obtained through a reliable source. Employers receive recommendations for improved performance and documentation for current compliance requirements. The process lowers costs and hassles associated with certification testing. Crane Industry Services travels to the crane and operator's location to conduct tests and documents each operator's qualifications. “Excuses don't work when an employer is behind on a job schedule or over budget due to skill levels that are lower than needed to complete timely, quality, safe work. QCOE also helps employers fulfill the 'employer duty' to provide documentation to OSHA regarding qualification of operators, but the main benefit is safer, higher quality work,” said Debbie Dickinson, CEO of CIS. For more information, visit www.craneindustryservices.com.